If you’re active on social media or enjoy reading blogs, you will no doubt be aware of the popularity of quotes. There’s something about quotes that many people find inspiring, motivating, and shareworthy. Perhaps they’re a good pick-me-up when times get tough, or maybe they remind us of the deeper meaning behind our everyday routine. 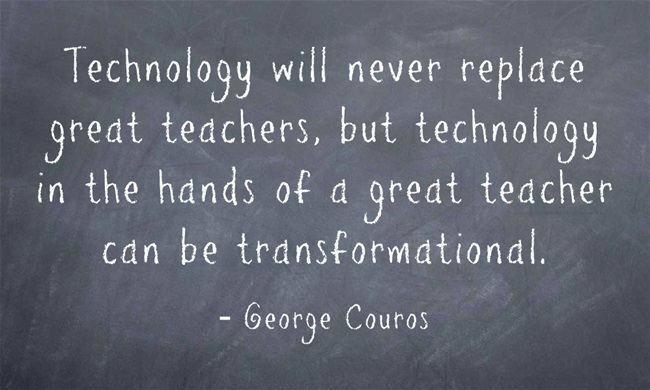 Sometimes quotes might offer a burst of insightful learning for the time poor. Whatever the case, quotes can be powerful. You can back up your thoughts and make your writing more credible. Student voice can be incorporated into a blog post written by a teacher. You can provide alternative viewpoints or encourage readers to reflect. Quotes can help you begin or end your blog post with impact. The research involved in finding quality quotes is a solid learning experience. Quotes can make your posts easier to read as they break up the text. You might already have some favorite quotes stored away that have never left you. Make it obvious which words are your own, and which words belong to someone else (by using quotation marks or block quotes). Make your quotes brief. There are no universal rules here. Some larger organizations have guidelines around how much your can quote (eg. Hubspot’s rules are 75 words). If you’re unsure or think you might be using too much of someone’s article, contact them to ask permission. Never copy the whole post. Always include the person’s name, and link to their site, article, or book if you can. Obviously if you’re quoting someone like Aristotle or Mother Teresa, hyperlinking is not as straightforward! There are many online tools where you can turn your quote into writing on an image. These can make your blog posts look more visually appealing, and are great to share on social media too. This is a really popular tool to make all sorts of graphic designs and documents. There is an adequate free version and it can be used by students under 13 with supervision. 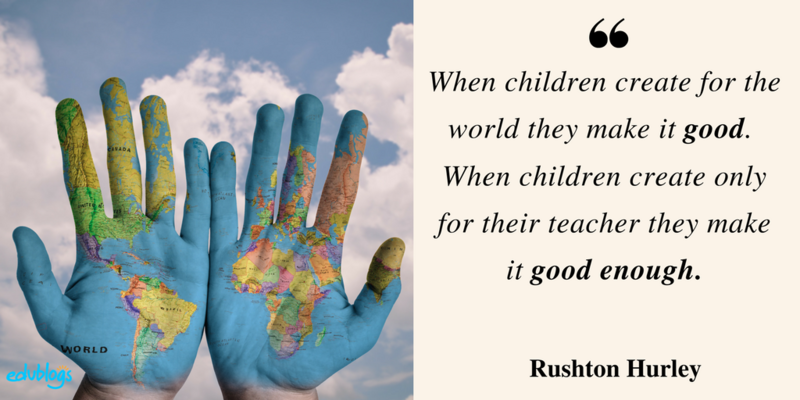 Here is an example of a quote I made with Canva. Similar to Canva, this online drag and drop tool allows you to make social posts and graphics. The free version is functional but has a watermark. According to a recent Adobe announcement, the premium features will soon be free for teachers and students. Handy! Here is an example of a quote I made with Adobe Spark. This is a user-friendly tool from Buffer (a social media scheduling tool). While Buffer is no longer updating Pablo, it seems to work well, and is fast and free. You simply add your text to a Creative Commons Zero image and save your work. This is a really simple tool which doesn’t require any sign up, so it’s ideal for young students to use. You simply add your text and choose your background before saving your image. Vision impaired visitors to your blog may be using assistive technology like screen readers to read the page out loud. If you put words on an image, write the actual words from the quote in the alt text section. Quoting young students: If you teach very young students, you could put the students’ quotes about their learning in a different color on your blog. This makes it easier for them to go home and proudly share their blue/red/green writing with their parents. 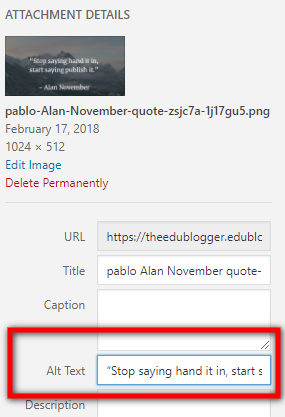 Exploring a quote in a post: If you have student bloggers, why not have them choose a quote from a fellow student’s blog post as a topic for a post of their own? They can explore the quote in detail and add their own thoughts and opinions. If your class visited the museum, you could add quotes from all the students about the day. Quote library: You or your students could start your own library of interesting quotes as you come across them. You could add them to a Google Doc and then refer to them when writing blog posts in the future, or house them on a page on your blog. Tip: BrainyQuotes allows you to set up a quote library with a free account (over 13s only). Quote of the day blog: Some people have a photo of the day blog. What about a blog where a quote is published each day? This could be a mix of quotes from members of the school community, or well known identities or historical figures. Bringing in the voices of experts or giving your students a voice through the use of quotations could have a big impact. 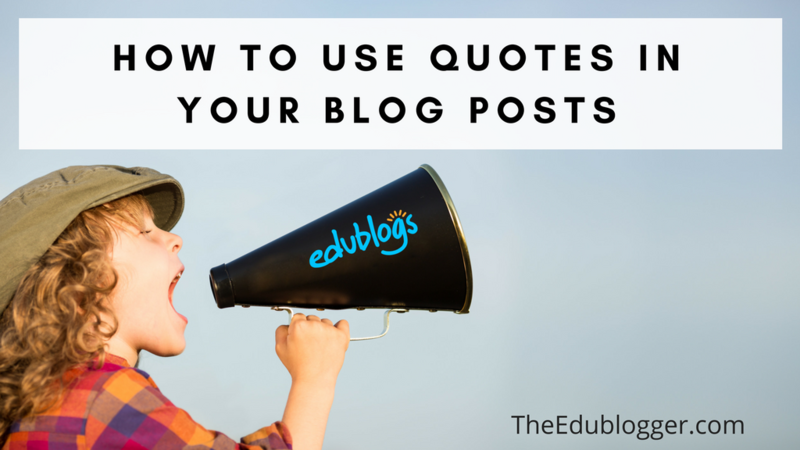 Why not consider ways that you and your students could integrate quotes into your blog posts? We keep moving forward, opening up new doors and doing new things, because we’re curious…and curiosity keeps leading us down new paths. 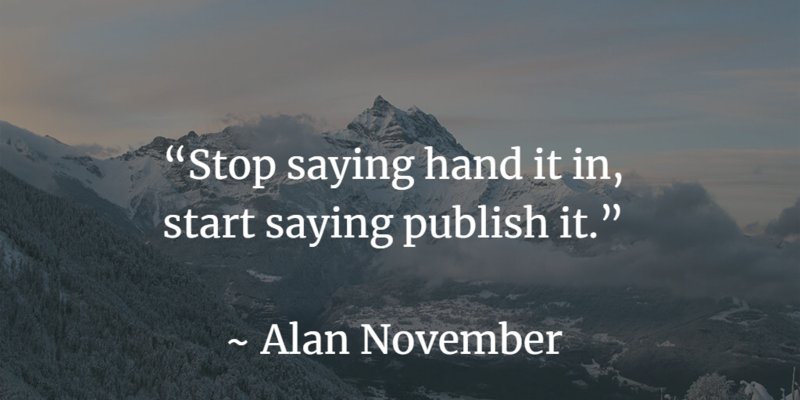 Do you use quotes in your blog posts? Share a favorite quote in a comment. Or perhaps you can share a website to find quotes or tell us how you display quotes as images. We’d love to hear from you. I used quotes in my blog, is that okay to use the quotes without permission, my blog is WordPress free. 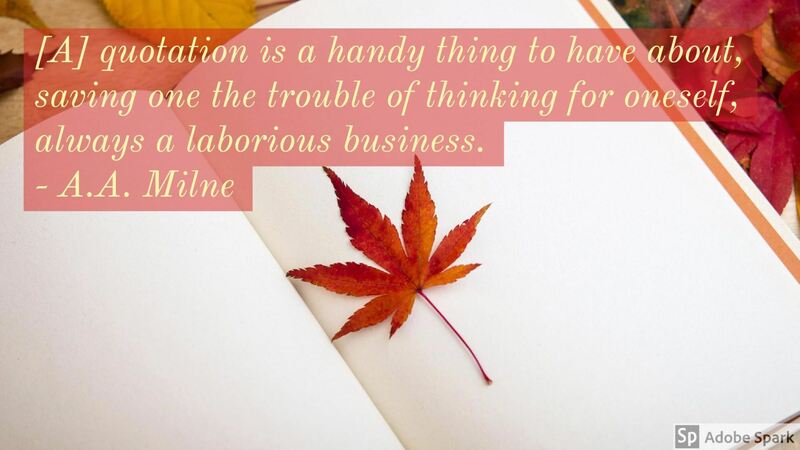 I hope you can share your ideas, I use brainyquotes too and goodread. You can use quotes from people without asking them. Just make sure you link back to them. However, this would be for short quotes. You probably wouldn’t want to quote more than a few sentences. This is a grey area but if in doubt about whether you’re quoting too much, ask permission. I love good quotes and often get inspired by them. Quotes are great, aren’t they? You’re welcome! Yes! the guide was great! Another great post full of suggestions that can enhance our class and personal blogs. One suggestion I would make is to encourage students and staff to take photos around their school that as Janet suggested have some negative space that is ready for a quote to be added to. This is a great way to have some discussions about framing photos and can also be tied to talking about respectful use of images particularly if people are included in the photos. These photos can be stored in a shared drive where ready for use when needed. it also gets them looking at their immediate environment through the lens of a camera. Thank you for sharing insightful quote points and helpful quote ideas! One idea for educators as professional learners I would like to add has to do with creating Visual Quote Cards while attending conferences or workshops. Begin by snapping photos that include “negative space” (open areas that are not part of focal point of the picture), which can be done in advance, just prior to, or during the event. When a presenter shares a thought or makes a point you want to capture, note the quote in a Google Doc or other notation tool. I love this idea! I think I’ll have to try it out next time I’m at a conference. I love the idea of sketchnoting at conferences too but I have no idea how people get them finished in short amounts of time. Or maybe they don’t! What a treasure trove of ideas and links! Thank you so much for all this. Thank you, Kathleen, your post is so useful and we really do love quotes. Only this year I began to quote my students posts: I will take a sentence from their text and put it on an image with my free software fotophiltre, or in canvas or even in stencil, as you taught me. He is a 10 years 5 th grade student who loves surfing, but has suffered a serious sprain ligament on his knee, but, nevertheless he wrote this positive post. Thank you for sharing this lovely example. I hope your student is back surfing soon! Easter sure is coming up quickly. It sounds like a busy time of year. This week I tryed Quozio and Pablo. I think they are very useful and nice to use. Thank you for making us always make a step forward! As usual, I learned from your post. May I share some resources as well? https://blogs.tees.ac.uk/lteonline/2014/09/29/10-free-sites-to-create-beautiful-quotations/ Lists several quote making site. I also like http://www.addletters.com/ to create images in posts. Thank you for sharing! I’ve visited the sites you indicated and kept the urls to come back and try some of them. I use fotophiltre (free software), canva and stencil, where I learned to go following Kathleen’s suggestions. I am glad that you find the sites useful. As a newbie blogger, I find both Quiozio and Addletter much easier to use. Hopefully, as I blog more, I will have more ease and incorporate others as well. Thanks. I have learned so much from you and everyone else. I am glad I am sharing something else as well . Thank you so much for sharing the amazing links. You are most welcome. We all learn from one another, ya?